C Shore Chateau is a five bedroom oceanside home in the Seacrest Village subdivision of Southern Shores. You can relax in quiet solitude overlooking a fresh water pond; it is just a short stroll to the beach (with no cross streets), and offers ocean views from the upper level. You can swim in the 14' x 26' pool, stretch out on over 1,100 square feet of decks, or watch the stars at night from the double chaise (or the hot tub) on the upper deck. Raining? Have a picnic on the all-weather porch or listen to the rain from the hammock under a covered deck. 3 bedrooms (huge master bedroom with King and 37" LCD/Blu-ray player with an oversized, walk-in closet, bathroom with double vanity, 6' jacuzzi tub and separate, large-tiled shower; 1 with Pyramid bunk and Single trundle; 1 with Queen and TV, DVD player, books, and access to covered deck with hammock), shares a bath (with tub and shower); laundry room (with washer and dryer and 2nd refrigerator). Great room with hardwood floors and area rugs, cathedral ceiling and ceiling fan; dining area (seats 8); kitchen with breakfast bar (seats 4), dishwasher, microwave; living room with gas fireplace, 47" LCD and Blu-ray (with sound bar and iPod dock), extensive DVD library; all-weather porch; powder room. Master bedroom (with Queen and bath with tub and shower); connecting den/bedroom with daybed with Trundle, 37" LCD TV with Blu-ray player, and books. C Shore Chateau is conveniently located on 8th Avenue Southern Shores, just a block away from the stationary lifeguard at Hillcrest Beach access. 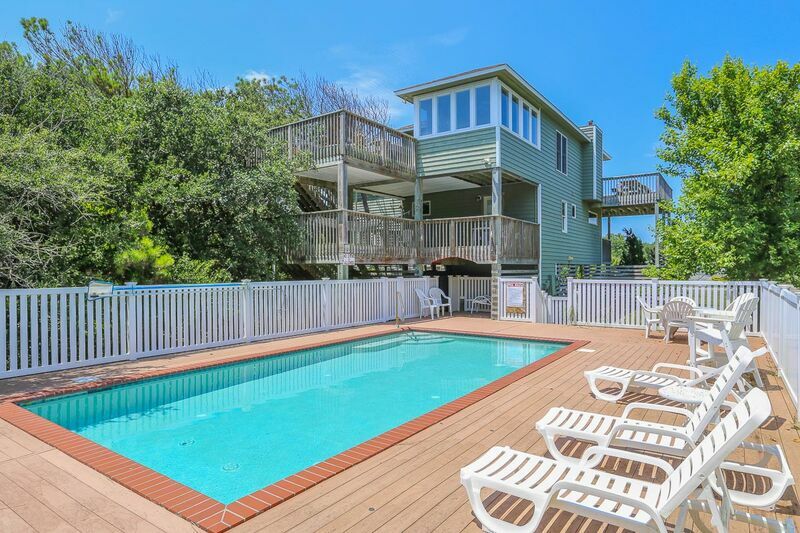 Being centrally located on the Outer Banks, this Southern Shores vacation home also offers you easy access, either by car or bike, to the Town of Duck, with its many quaint shops and eateries. Or it’s a short drive to the south to hit the more commercial areas of Kitty Hawk, Kill Devil Hills, and Nags Head. This home has comfortable living spaces both inside and outside. Make plans now to spend your next Outer Banks vacation at C Shore Chateau. DOGS ON THE BEACH: From May 15 to September 15 of each year, dogs are allowed on town beaches before 9 AM and after 6 PM with a leash not to exceed ten (10) feet in length and must carry a scooping device. Leash laws enforced remainder of year.